Though Linenspa is a quite young company that just started their business in 2011, it has gained the trust from plenty of customers. Along with offering mattresses of all types, Linenspa also have many bedding accessories such as pillows, mattress toppers and mattress toppers. Hence, you can think of Linenspa whenever you are in a buying mood for buying bedding items. Especially, most of the products of Linenspa have highly rated on online shopping sites. Are you in need of improving the quality of your sleep but haven’t known which mattress is right for you? 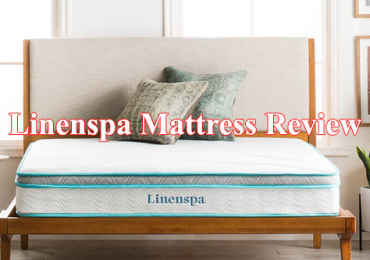 We are going to do a review on an innerspring hybrid mattress that has medium firm feel, so if you are also looking for a mattress like this, let’s see the below details of Linenspa 8″ Memory Foam and Innerspring Hybrid Mattress. With all things are considered, we don’t guarantee this mattress will suit the needs of all types of sleepers, but if you are back or stomach sleepers, this mattress is definitely worth your considering. The construction of this Linenspa mattress is built from the combination of memory foam and coil system, for totaling 8 inches in thickness. The top is the 1.5-inch memory foam layer directly quilted into the mattress cover. The foam used is CertiPUR-US certified, ensuring the safety against dangerous chemicals and elements, and the environmental sustainability features of the product. This layer is aimed to provide the cushion, softness and contour while lying down on it. For the base, it is made of 6-inch layer of tempered steel coils. This layer will create the bouncy feel and pressure relief. The knit fabric used is constructed from a unique blend that consists of 53% polyester fiber, 39% rayon fiber, 6% polyurethane foam, 2% polypropylene fiber. Due to this blend, it can provide the great softness and breathability. The memory foam used for the top makes it good in providing contour but prevent sleeper sinking down in the mattress. It will be contouring to your body shape nicely. Moreover, the mattress is also designed with good firmness. It means that the mattress has medium firm feel. If we rate 10 is the firmest level on the firmness scale, this mattress lands between 6 and 7 out of 10 on the firmness scale. Hence, it is better at keeping your spine alignment in proper way. Along with that, it doesn’t provide too much bouncy feel, but the bounce is just necessary enough to feel comfort and support. In addition, those who sleep on their back and stomach would benefit from this firmness, whereas, side sleepers would be hard in finding their right comfort and support. What else? The coil system is also good at letting air to flow through the mattress, and then improving the cooling feel. Lastly, noise may be also an important consideration for some when choosing an Innerspring hybrid mattress, the nice thing to know is this Linenspa mattress just keep itself quiet thorough the night, so there would be nothing to interrupt your sleep. 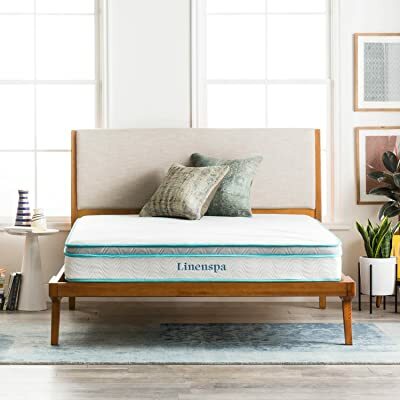 When you purchase this Linenspa mattress, you also have a ten-year warranty that includes replacement, repair, and a refund in case you don’t feel content with it. 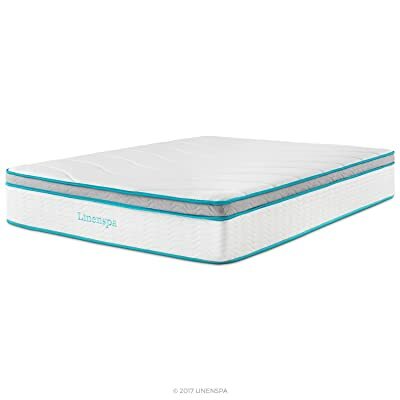 Who would Like this Linenspa 8″ Memory Foam and Innerspring Hybrid Mattress? 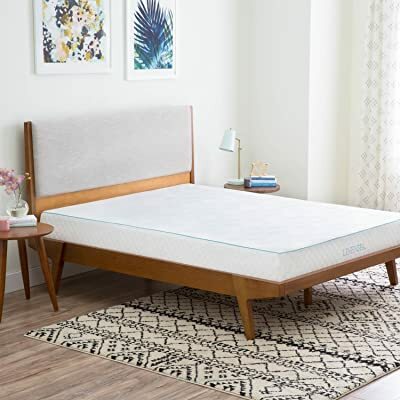 If you are more into all foam mattresses, but feel afraid of heat retention, this Linenspa 10 Inch Gel Memory Foam Mattress can be a great choice. 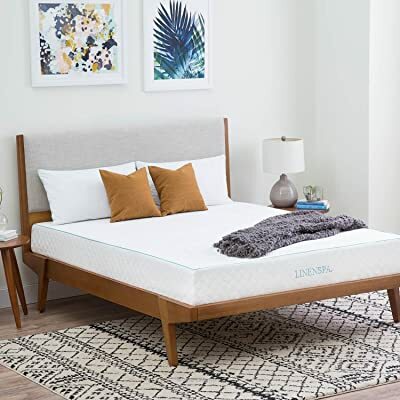 it is built from A 3.5-inch layer of gel-infused memory foam sits atop a 6.5-inch layer of supportive base memory foam. And, the gel infusion can make you worry-free. Lastly, the mattress will be more suitable for side and back sleepers because it has medium firm feel, which comes about 5 out of 10 on the firmness scale. If you prefer more “plush feel”, and need to be sunk further down into the mattress, The Linenspa 8 Inch Gel Memory Foam Mattress would be nice to sleep on. It is an all foam mattress, which is fairly soft and excellent at providing contour. In terms of firmness, this mattress would come about 3 out of 10 on the firmness scale. Hence, side sleepers can feel more supportive, whereas, other sleepers can lead to discomfort. Lastly, the foam is infused with cooling gel, the mattress is less likely to absorb and retain heat. The last additional recommendation is a hybrid mattress that comes in 12 inches in thickness. The construction of this mattress has 4 different layers atop the 8 inch-layer of Individually-Encased Coils. Due this construction, it can provide a good contour and deeper sinkage. However, the mattress doesn’t have a good firmness to be suitable for heavy sleepers. In addition, the mattress also has gel infusion in the foam for improving cooling feel.